Stainless steel push to connect fitting male Y swivel is used to connect a female thread to two tubes running in the same direction in Y-shape. It has a swivel male thread on one end and two push-to-connect tube connections on the other end. Stainless steel push to connect fitting male Y swivel is made of 316 stainless steel for higher strength and greater corrosion resistance than 304 stainless steel. The fitting is suitable for handling pressures up to 435 pounds per square inch (psi) (30 bar) and has an operating temperature range of -20 to +150 degrees C (-4 to +302 degrees F). Stainless steel push to connect fitting male Y swivel is suitable for applications where brass, nickel plated and acetal are banned. These fittings are designed to withstand corrosive environments (substances), to channel aggressive fluids and to be used in the food, dairy, pharmaceutical and chemical industries, as well as extreme hot and cold conditions. 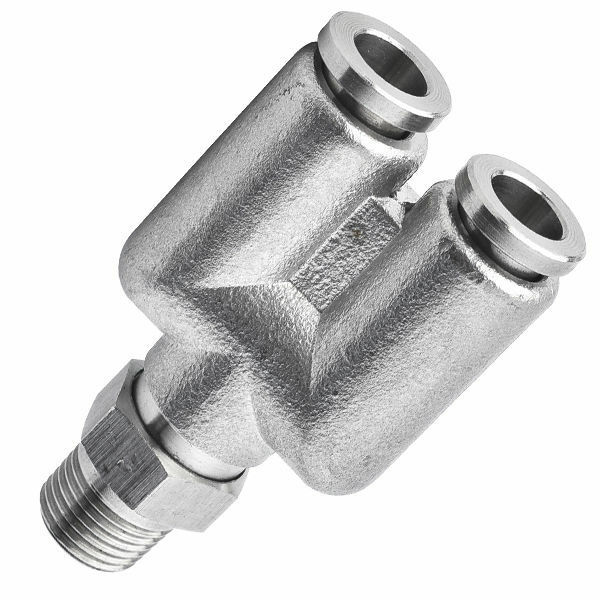 Male Y swivel stainless steel fittings are available in both inch and metric sizes, and can be used with a variety of tubing materials. Male Y swivel stainless steel push to connect fittings have swivel (rotate 360°) hexagonal thread allowing tightening with flat spanner. In this category you can find push-in fittings with threads in following sizes: R (PT, BSPT)1/8 to R(PT, BSPT)1/2, and 10-32UNF to NPT 1/2 for hoses with diameter from 4 mm to 16 mm and 1/8" to 1/2".